Make faster work of plucking out the most critical messages queuing up in your Outlook inbox by using this strategy from the Microsoft Outlook Best Practices guide. The simple trick is to make messages appear differently, de­­pending on who they’re from or whom they’re sent to. It’s called conditional formatting. For example, a message from your boss might appear in red and in a larger font. Or, perhaps you’re cc’d on a lot of messages and you’d set up your inbox so that any message with only your name appearing in the “To” line is formatted to grab your attention. 1. To set up conditional formatting, go to the View tab, in the Current View group, and click View Settings. Then click Conditional Formatting. 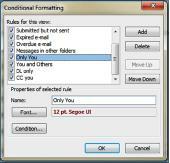 To create your first conditional formatting rule, click Add. 2. Next, click Condition. Specify that you want this to apply where you’re the only person on the “To” line. 3. Click OK, then Font to choose how you want the text to look in the list. Now you can repeat these steps to create formatting for other situations. The different sizes and colors can help you see the most important emails and save the others for later. — Adapted from “Conditional Formatting: Highlight your most important mails,” Josh Meisels, Outlook Blog. Are some behaviors holding you back? Do your supervisors know their FMLA duties?